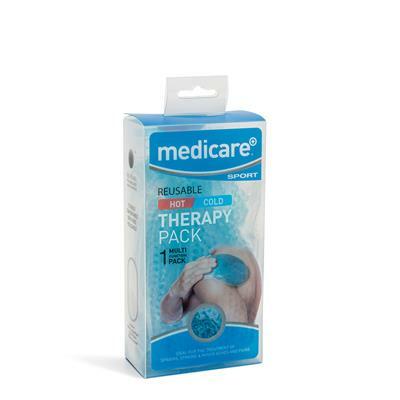 MEDICARE REUSABLE HOT & COLD THERAPY PACK COMBINES THE THERAPEUTIC POWER OF BOTH HOT AND COLD THERAPY INTO ONE CONVENIENT PACK. PROVIDES RELIEF FROM EVERYDAY ACHES AND PAINS IN A SOFT, FLEXIBLE, DRIP FREE PACK. MAY PROVIDE RELIEF FOR: SPRAINS, STRAINS, SWELLING AND BRUISING AND MINOR ACHES AND PAINS OR WHENEVER HOT/COLD APPLICATION IS REQUIRED. DIRECTIONS: USE 20 MINUTES PER TIME, WAIT FOR 30 MINUTES FOR REPEAT USE. HOT THERAPY - HEAT IN MICROWAVE AS SPECIFIED BELOW. TEST PACK TEMPERATURE BEFORE USE. HEAT FOR AN ADDITIONAL 10 SECONDS UNTIL DESIRED TEMPERATURE IS REACHED.